Vasantha Urchavam is a ten day Festival depicting the blossoming of love. 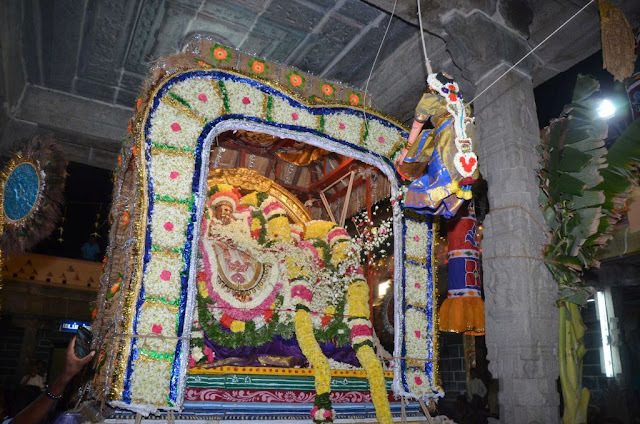 During this sacred event, Swami and Amman are gorgeously decorated with jewels. 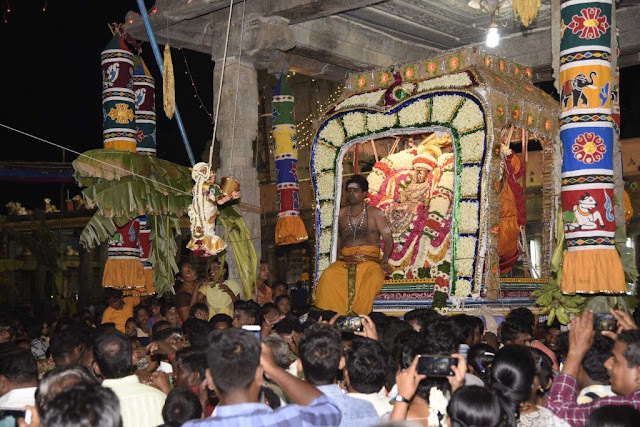 They are taken with great ceremony in Mahapradakshina round the sacred Mahila Maram (trees) within the Third Prakaram—ten times every night for ten days = 100 times. 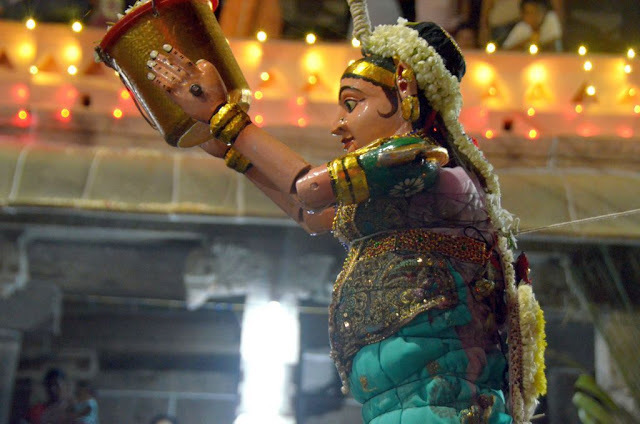 The third day of Vasantha Urchavam celebrates the birth of Manmatha, also known as Kama the God of love (lust). 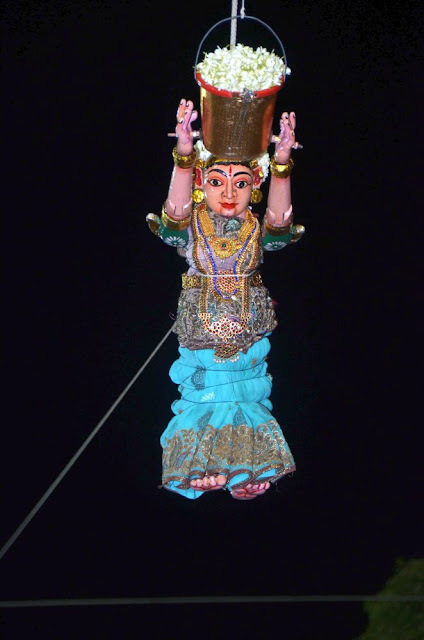 Manmatha is depicted looking for Siva. At 9 p.m. on the fifth and eighth days the Temple lights are switched off so that the procession is in the dark. After going around the sacred Mahila Maram ten times the lights are switched back on to great rejoicing. Lord Shiva opens His third eye on the final days of the Festival and the burning of Manmatha takes place. During this sacred Festival the Jumbo Keswara Lingam, that is set in stone on the raised platform in the midst of the sacred trees is filled to capacity with water. Plants and flowers are placed to float inside the recess of the Lingam, appearing to make the Lingam levitate and blossom. 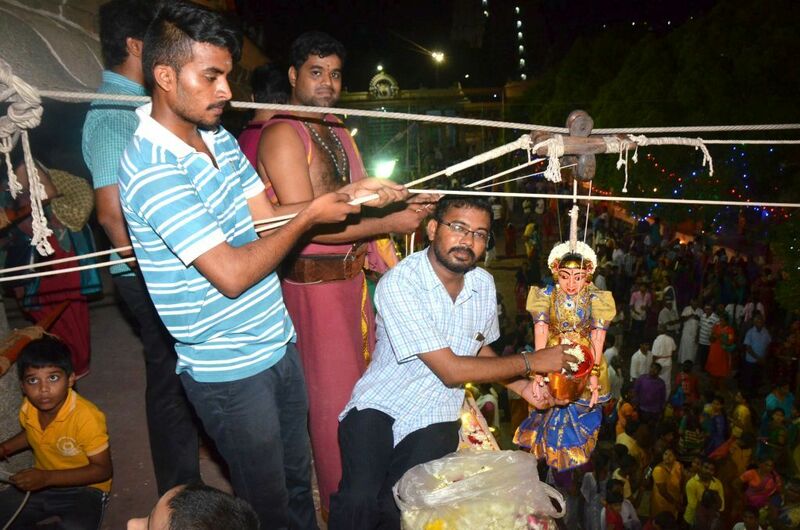 Each evening for the first nine nights of this Festival, Lord Somaskanda (a form of Siva/Pavarthi) is brought to the Paneer (Rose-water) Mandapam in the 3rd prakam. During this function the Gods are showered with flowers by the Gandharva Kanya enactd by the celestial nymph in the form of a puppet. 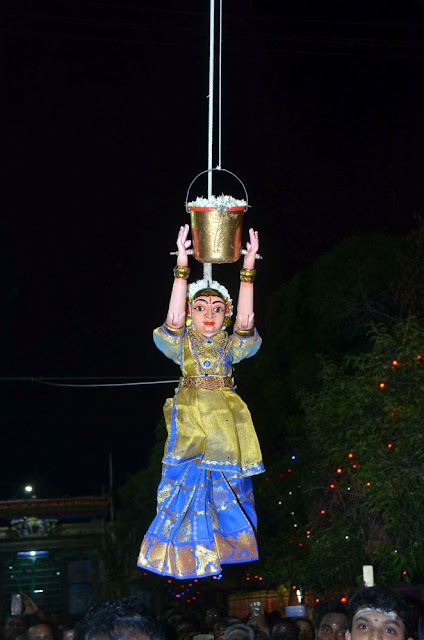 The Kanya puppet comes many times to the Paneer Mandapam and showers buckets of flowers onto the Gods. Afterwards ten processional rounds around the Makila Trees takes place, accompanied by musicians and singers. At the completion of each round, the Gods dance in front of a mirror and then remain seated under the Paneer Mandapam while receiving two floral showers from the Gandharva Kanya. 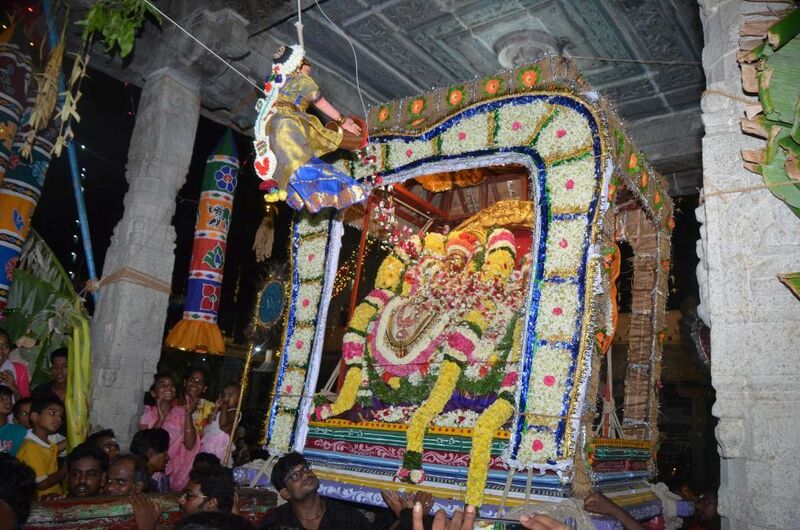 During the Vasantha Utsavam Festival, the appearance of the Gandharva kanya (celestial virgin nymph) represents the expression of desire and the virtue of union which is further emphasised by the flowers, fragrance and music of the ritual. 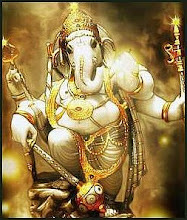 Gandharvas are celestial beings and also musicians. 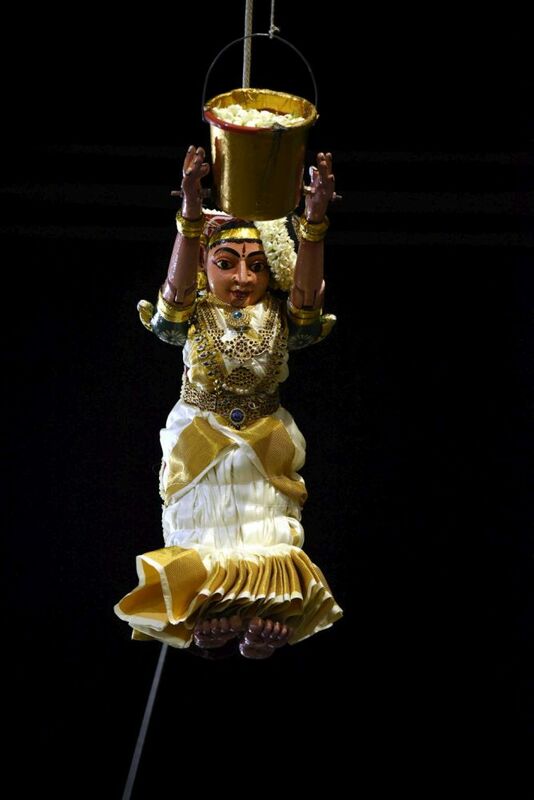 In Hindu mythology, the Gandharvas are demi-gods, who are somewhat less powerful than the Devas. They are sometimes said to reside in the Swargaloka, but some sources put their abode as Gandharvaloka. Their father is sage Kashyapa and their mother is Arishta, a daughter of Daksha. They specialise in dance and music, and are also skilled in dark magic. They are the guardians of Soma, the divine nectar of immortality and teacher of the Moon who is also called Soma. 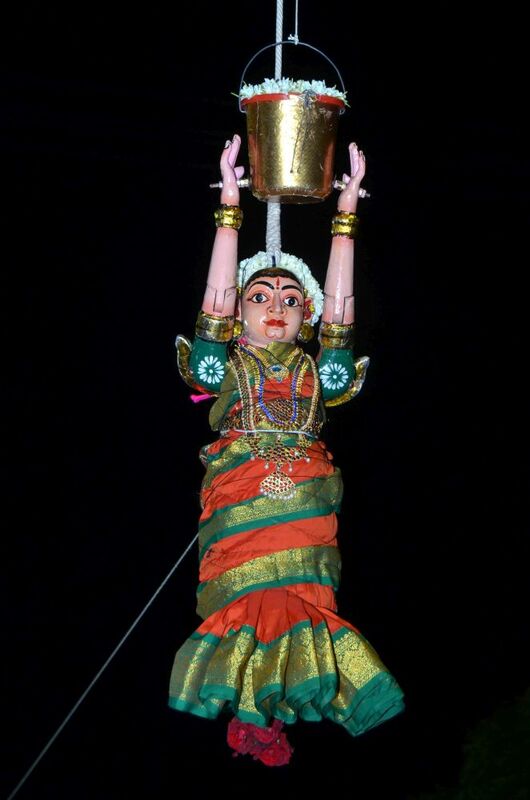 The Gandharvas are attributed with a mystical power over women and the right to possess them. They are invoked in traditional Hindu marriage ceremonies and in the Brahmin tradition, the bride who is to be married is supposed to belong first to Soma, to Gandharva and to Agni before becoming the wife of a human being. A Gandharva marriage is a love marriage (not an arranged one). The wives of the Gandharva men are usually celestial damsels, apsaras. To Arunachala Mystic, dedicated to sharing information about the spiritual, esoteric and mystical side of Arunachala; premier Shiva site in all India. As well as giving readers the opportunity to arrange pujas and rituals at various private Arunachala Temples and Shrines, Arunachala Mystic will also give information about more mystical and esoteric aspects of Arunachala. In this respect readers are invited to participate by sharing their own experiences of Arunachala.